The above chart compares the estimated median home value, the median price and the number of units sold between January and October in four neighborhoods over the past three years. A look back at housing in the Reno-Sparks shows things performed as expected. The number of units sold averaged 548 units per month, which is typical for the Reno-Sparks market. Even with monthly highs and lows in unit sales throughout the year, the Reno-Sparks market historically averages between 500-550 sales per month. To date, this year’s sales appear to be on that same track. Year-to-date sales numbers through October 2016 at 5,478 are up 1.5 percent compared to the same period in 2015 at 5,399. This is down when looking at the year-over-year numbers for 2015. In 2015, unit sales were up 6 percent over the prior year. The Tesla effect we experienced in 2015 has lessened. Many expected a rush of homebuyers relocating to the area to take over their positions at the Gigafactory and the area experiencing new and expanding businesses. Anecdotally, I have only heard of a handful of Realtors working with buyers who are relocating and purchasing homes as Tesla employees. According to the data from the Johnson, Perkins Griffin 3rd Quarter Apartment Survey, the rental rate for 3 bedroom, 2 bath units is $1,420, up 12 percent from the prior year. A 3 bedroom, 2 bath single family residence median price in October was $306,000. A buyer with good credit obtaining a conventional loan with 5 percent down and interest at 4 percent would have a monthly payment of approximately $1,790 per month (principal, interest, taxes and insurance). Assuming a 25 percent tax bracket, the homebuyer would have deductible interest when filing a tax return, bringing the net monthly payment down to approximately $1,550. So with rents on the rise, homeownership is within reach of many tenants. A common question on the street is, “Are we looking at another real estate bubble?” All the indicators say no. If you look at pending sales, unit sales, new listings and median price there is no one factor that is out of alignment or indicating signs of a bubble. They are all following a more seasonal trend with a downturn in the market after school begins and the weather cools. Sellers are asking, “Is now the right time to put my home on the market?” In years past, the spring buying season kicked off in March; nowadays, buying takes place year-round. Any buyer who is willing to brave the lower temperatures during the holiday seasons is serious, and I’d advise sellers to let them in. 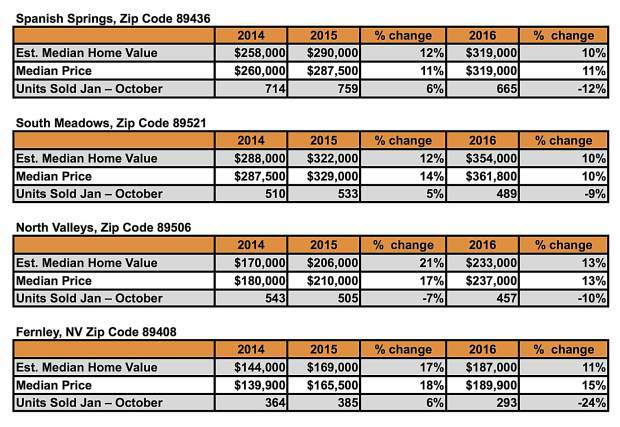 Last year at this time, we looked at some neighborhood zip codes to determine how specific areas of the market were performing. We compared those same neighborhoods this year (see table above). While median price continues to be on the rise, you can see that the increases have slowed from the prior year, along with the slow down in unit sales in these neighborhoods. The Reno, Sparks and Fernley markets have a lot to look forward to in the coming 12 months. I’m looking forward to a healthy, sustainable real estate market in 2017.